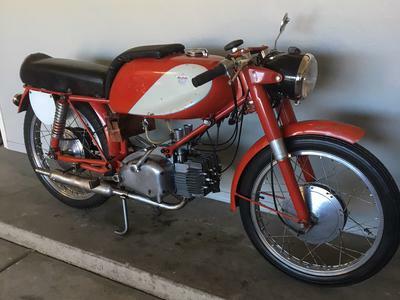 The 1958 Moto Rumi for Sale by Owner is the original 125cc Gentleman Moto Rumi Junior that was manufactured in Bergamo Italy. This old bike is in 99% original and complete condition. I can provide all the history on this vintage bike. Go here to see others that are available and you will see that this nice ride is the best deal for you! Along with the history, the new owner will receive extra parts and complete reference data. The Moto Rumi Junior for sale is in AZ Arizona, USA and my price is 12K but I would be willing to take serious offers or trades into consideration. Express your interest or ask questions using the comments form below provided by GoGoCycles Used Motorcycles for Sale. Contact Ed for photos and more information.